Slaven Vlasic/Getty ImagesDonald Trump at the Success by Trump fragrance launch at Macy's Herald Square in 2012. Macy's (M) is ending its 11-year partnership with Donald Trump, in response to uproar from Hispanic consumers who were upset with the businessman's disparaging remarks about Latinos. "Macy's is a company that stands for diversity and inclusion," the company said in a statement Wednesday. "We welcome all customers, and respect for the dignity of all people is a cornerstone of our culture. We are disappointed and distressed by recent remarks about immigrants from Mexico." In a separate statement, Trump said he was the one who decided to terminate the partnership, citing "the pressure being put on [Macy's] by outside sources." Trump also said that he has "never been happy about the fact that the ties and shirts are made in China." "While selling Trump ties and shirts at Macy's is a small business in terms of dollar volume, my principles are far more important and therefore much more valuable," he said in the statement. Trump's menswear collection, which includes ties and dress shirts, has been carried at the department store since 2004. The partnership's end comes after more than 728,000 people signed a petition on MoveOn.org asking Macy's CEO Terry Lundgren to "dump Trump." And on Tuesday, online Latino organization Presente.org issued a statement saying it "demand Macy's take a stand against discrimination." Following Macy's announcement, Angelo Carusone, who started MoveOn.org's petition, said the retailer has "finally made the right decision to stop investing in and supporting Donald Trump." Arturo Carmona, executive director of Presente.org, said the organization is "thrilled to see Macy's dumping Donald Trump's toxic discrimination against Latinos." 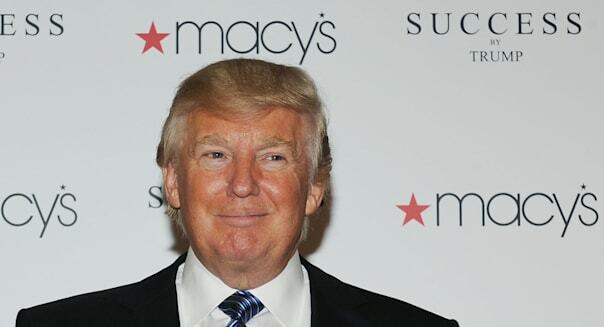 Macy's move also follows decisions by NBC and Univision to stop airing his "Miss USA" and "Miss Universe" pageants. Macy's has prioritized building connections with Hispanic customers, through its exclusive line with Mexican performer Thalía Sodi, and by holding Hispanic Heritage Month events in its stores. The department store also sells products from Ivanka Trump's fashion line.